1. I'd order two replacement Stamps Vikings- that shape is my daily driver, bread and butter board. Both of the boards would be 9'4"s (I'd leave the other dimensions in the hands of the guy who knows best- the shaper) shaped as carbon copies of each other. Of course they'd have to be sprayed Mahi-style. I'd leave one down in Southern Baja at my friend Tim's resort- that board would be stored and ready for surgical surf strikes when the chubascos start whirling in the early Fall. 2. There would definitely be room for a nice, light, nose rider. The shape that you'd want to ride on those high tide, chest high days when the waves are a little bit full. I'd go for a 10' Ninja model with the new single bump/round tail; a larger version of the board that Farmer Dave was ripping on in the Mainland Mex video. This one would be the call when you felt like walking the nose and throwing down smooth turns. It's definitely be a fun one to have around and I could see it getting some solid use. Photo: Spork's got a dream quiver all figured out- the details of his collection are a little sketchy. But one thing is for certain, there'll be a lot of noses in that rack. 3. For those big water, winter days I'd like to pick up a 12', relatively heavy Viking Reef Cruiser. This would be the board I'd chose for catching the big, outside rollers that come steaming through in the winter months. The key on this one would be to keep it pretty beefy. On waves with a lot of push and built in speed, a bigger, heavier board gets you in earlier and builds speed like a locomotive. All that inertia just powers through the chop and smooths out the ride when you get going really fast. I'd like to see the tail pretty foiled too- giving the thing some bite off the bottom. 4. Finally, I'd pick up one of those Grim Rippers. If you ever get a chance to see one in person, you'll want one too. They look too fun to pass up. I'd go with something in the 8'6" range and I'd definitely go with a quad set up. I think on shorter stand up boards the quad really starts to work- maybe on the shorter boards you can get your foot back over the fins to power them up properly. The shorter stand ups are whole different take on the stand up game- I think they may be particularly suited to the pop-up peak, take-off-and-jam conditions that we get down here on the beach breaks. In any event, I'd be stoked to pull one out now and then. That's my dream quiver- what's yours? I have been busy but my fishing season is now coming to a end with the kids starting school this week so I will be contributing some cool stuff on the rebirth of a surfboard builder. Well my quiver is taking shape as far as my rocker and outline templates go. My choices being a longboard surfer 1st and shortboard power surfer 2nd my quiver will be as follows. 11' nose rider a little heavier for glide, more rocker than traditional prone log and a little curvyer template at 29.75 wide. This will be my allaround fun wave board single fin with the ability of a thruster, nice nose concave with flowing Vee through the tail. Diamond tail of course. 9'8" performance style standup longboard, 20.5-30-16" tail real curvy outline nose concave realy foiled and Vee through the tail. Hard edged rails and right on the edge of being to light, 2+1 fins. 8'0" 20-30-17" fat round nose fun style I recently rode a 7'8" and it was a blast but a little thin for me. 2+1 fins or twinzer with baby thruster fin. Finally well almost, 7'2" fish style stand up I have been working on a template and blew up on of my favorite prone surfing fishes. To get the curves right It came out to be 20"-30.25"17.5" x 5.5" thick old style twin fins with a box for small thruster swallow tail 10" point to point lots of Vee because this one is a rail surfing board. Maybe a larger wave 10'er round pin tail for those days it realy gets good and hollow and you need some holding power. A nice confidance building board that will not act up or skip out with the speeds reached on bigger waves. If you would notice I do not put anthing through the fins or center of the board just a flowing Vee through the tail. Why you ask simple a complicated board is usually complicated to ride and figure out. I used to shape for a few pros years ago and most just wanted a flat bottomed board or a little Vee in the tail. Why? Because they did not want to figure a board out they just wanted to ride it like they have been riding that board for years. 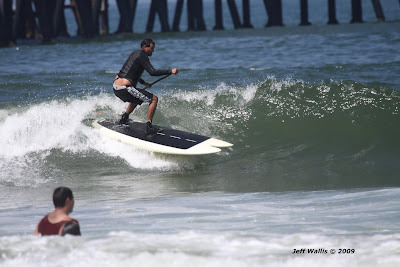 Not that all the fancy double barrel concaves and stuff do not work because they do but as far as consistancy with no surprises when the waves change as far as the board acting wierd in certain conditions keep it simple, and make it flow. KISS = Keep It Simple Stupid and you will never be bummed out on a board shape. Sounds rad... and you say it's, "taking shape"... that means it's not a dream quiver, it's a "for real" quiver.... sick! Can't wait to see it! How many noses on this one? Why the diamond tail on the 11' daily driver? Pros and cons? About the diamond tail. I used to ride alot of square and swallow tails all around and round/pin tails in bigger surf. I like the way the points of a square or swallow feel and I can feel where the end of the tail is. But the square or swallow on a bigger board makes your turns choppy sometimes and with a bit of speed tend to get skittery. (Nose bounce on a hard turn) I am sure you have seen it big time on a paddleboarder or long boarder. A diamond tail gives a nice smooth arc on a turn like a round tail, planes out like a square and holds well with higer speeds and pulling the points of the diamond forward 1.5" and adding excessive Vee to the last 6" seems to give the drawn projection of the swallow if you turn forward of the fins, but at the same time with a foot adjustment over the fins it will give the planing quik snap of the square and all the time hold like a pintail but remain stable like a big square tail. I have been watching alot of old surf flicks and its is funny how a certain type of board shape somewhat makes a persons style and surfing look the same. Back in the old days of my prime surfing/shaping years I figured out if I could see a guy surf I could build him a board that would clean his style up and give him or her what they are lacking. Shape room is done, got my foam and cutting the blanks today. My wood should be here tomorrow, High density balsa for the rail inlay to help with paddle strikes. Peace, Totaly stoked 3 tropical systems in the atlantic and they are calling for a 16 second 6ft swell by friday. WOOO HOOO!!!!! Got to get my boards done.